View Portland Basin in a larger map (opens new window). A disused reservoir surrounded by grazing land, rock bottom with extensive aquatic vegetation. Access is off the Port Fairy-Hamilton Road, 6.5 km from Port Fairy, through private property (The Rocky). Follow the track to the left past the house and through two gates. In 2009 the boat launching site and the access track were upgraded under the Enhanced Recreational Fishing Program. Additional funds have been provided through the Adopt-A-Stream grants program to reestablish riparian vegetation. Contains brown trout and rainbow trout to 1.3 kg. Also contain some redfin to 1.2 kg. Mudeyes are usually the best bait. The weed growth can at times make fishing difficult. Recreational Fishing Licence revenue was used to replace the fish barrier on the outlet. Stocked regularly with brown trout and rainbow trout. This tributary of Camp Creek flows through farmland, gravel and mud bottom. Public access only at road bridges but the creek here tends to be choked with cumbungi. Access to better areas is through private property and permission must be obtained. Contains short-finned eel, tench, river blackfish, common galaxias, mountain galaxias, southern pygmy perch and possibly small redfin. Not recommended as an angling water. A former railway storage, 2.5 m deep, abundant aquatic vegetation. Only bank fishing is permitted. Contains redfin to 1 kg. A series of five natural coastal lakes surrounded by farmland and sand dunes, sand and mud bottom. Contains a unique assemblage of native fish including Australian smelt, common galaxias, southern pygmy perch, river blackfish, eastern dwarf galaxias and Yarra pygmy perch. Also contains redfin, tench, and eastern gambusia. No longer stocked with trout to protect threatened fish species. Flows through farmland, mud and rock bottom. Easy access through private property but please obtain permission. Carries only short-finned eel, and river blackfish to 150 g. Not recommended as an angling water. Surrounded by bush and open land. Dry in most years and when full rarely carries fish except for short-finned eels. Flows through stony rises, scrub and grazing land, rock and mud bottom. Abundant aquatic weed. Contains abundant river blackfish, some short-finned eel, tench, common galaxias, mountain galaxias, southern pygmy perch, Yarra pygmy perch and congoli. A study is being made of the movement of congoli and short-finned eels into this creek and Lake Condah. A rock-ramp fishway has been constructed at the flow gauging station. Flows through scrub and grazing land to Yambuk Lake, mud and gravel bottom. Abundant aquatic vegetation in many parts, but the upper reaches have been modified into a steep-sided channel. Contains short-finned eel, tench, goldfish, congoli, river blackfish, mountain galaxias, southern pygmy perch, flathead gudgeon, eastern dwarf galaxias and Yarra pygmy perch. Reported to carry an occasional brown trout. The lower estuarine section carries estuary perch, Australian salmon, yellow eye mullet and black bream. Flows through stony rises, swamps and farmland, rock bottom. Public vehicle access to the riverbank only at Heywood, the Princes Highway Bridge and the public boat ramp at the river mouth. Contains short-finned eel, congoli, river blackfish, shorthead lamprey, pouch lamprey, common galaxias, flathead gudgeon, mountain galaxias, southern pygmy perch, and Yarra pygmy perch. The estuary section extends approximately 16 km and contains black bream to 800 g, estuary perch to 1 kg, flounder, yellow eye mullet, Australian salmon and sea mullet. 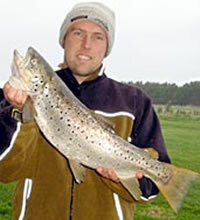 There are reports of brown trout at some times of the year. There is access to the estuary through private property at Wrights Bridge (please ask permission). The estuary provides boat and bank fishing all year round with shrimp, crabs, sandworms, minnow, whitebait and clickers being popular baits. Flows through grazing land in a series of runs and pools, mud and stone bottom. Sluggish flow in summer. Carries short-finned eel, congoli, tench and some brown trout. Also common galaxias, flathead gudgeon, mountain galaxias, shorthead lamprey, and southern pygmy perch. The estuary extends 4.8 km inland from the mouth at Port Fairy. This section contains mainly estuary perch, mullet and Australian salmon, but black bream to 800g, barracouta, flounder, snapper, whiting, yellow eye mullet, silver trevally and occasionally mulloway are also caught. The whole area is open for bank fishing and boats can be launched at Port Fairy. Best baits are sandworm, shelled prawn, squid, crab and clickers. Stocked with brown trout until 2009. Flows through grazing land to Lake Yambuk, mud bottom. Has low summer flows. Carries short-finned eel, pouch lamprey, trout galaxias, common galaxias, flathead gudgeon, shorthead lamprey, southern pygmy perch and congoli. A small population of brown trout to 600 g is reported to be present. Local knowledge is useful for fishing in this river. Situated in an old volcanic crater in Mount Eccles National Park. Very steep banks, rock bottom. Access requires a steep climb down the bank. Boats cannot be launched. Reported to contain some redfin and a galaxiid species. Not recommended as an angling water. Flows through stony rises, swamp and grazing land, rock bottom. Access is restricted to road crossings. Water level fluctuates widely and in summer flow is low and water temperature high. Contains short-finned eel, common galaxias, congoli, southern pygmy perch and Yarra pygmy perch. Also reported to contain occasional brown trout and river blackfish. The estuarine section is 2-3 km long and contains black bream, yellow eye mullet, flounder and Australian salmon. A shallow freshwater lake located in a volcanic crater. Carries no angling fish species. An estuary fed by the Shaw and Eumeralla Rivers and surrounded by sand dunes, sand and mud bottom. Boat and bank fishing are possible throughout the year. The lake also provides boat access to the lower reaches of the inflowing rivers. Most common angling fish are black bream to 700 g, yellow eye mullet, Australian salmon, estuary perch to 1.6 kg and flounder. Short-finned eel, congoli, Australian smelt, common galaxias and flathead gudgeon also occur. Popular baits are shrimp, crab, sandworms, minnow, white bait and clickers.